Spectacle surrounds me. The majesty of the land, sea and skyscapes almost overwhelms. It is hard to process the sensory assault of sights, sounds and smells, the frigid touch of the air, the taste of salt on my lips. The vistas that addle the eye, the moist hollow exhalation of a humpbacks breath, the fishy farmyard tang of penguin guano. But this is not just data. It is raw, visceral and emotive. The most incredible thing about Antarctica is how it makes you feel. Insignificant. Miniscule. Perhaps shrunk from our egotism we feel our real size, vulnerable hair-less apes don't seem so big and clever in a blizzard. Antarctica is so immense, both in terms of its expansive geography and riotously rugged topography, you can't help but feel small. Our cruise has barely brushed the tip of the proverbial ice-berg, the slender finger of the Peninsula that reaches out to tickle Tierra del Fuego. 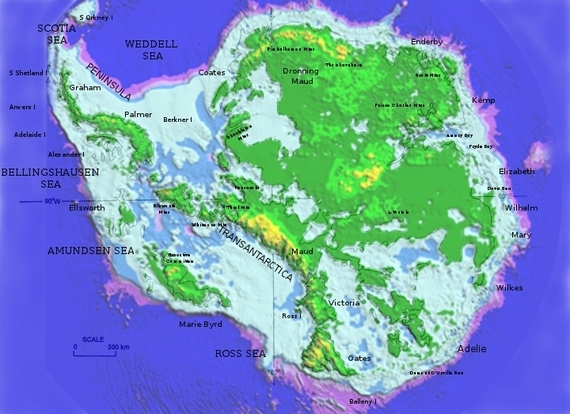 The mountainous Trans-Antarctic massif is massive, but almost entirely buried beneath a smooth all consuming cloak of ice often thousands of metres thick. Whisk it away and Antarctica is not a single land mass but a vast archipelago of mountains and basins. I feel infinitesimally tiny. Transitory. The ice is hundreds of thousands if not millions of years old in places. Air trapped in cores drilled out from the sheet shows us the mix of gases in our ancestral atmosphere. Up to six hundred thousand years ago. At that time our hominid heritage was still grubbing about with rather rudimentary intelligence somewhere in sub-Saharan Africa. I am but a blink in the eye of this ancient world. I feel stupidly young. I am touched by beauty. The creativity wrought by the elemental pairing of hydrogen and oxygen is astonishing. I see the bonds between them that make up the majority of me, us, unleashed to a world-shaping potential. It is exhilarating as monstrous glaciers grunt and grind over the rock before calving to build castles in the sea. And what castles. Nature is a restless sculptress. Her tools are primary forces; the wind, waves and sunshine. Even the bubbles trapped in the ice carve grooves as they're released. The ocean bristles orgiastically with flamboyant but ephemeral creations. Bergs like enormous cuboid edifices of blocky brutalism. Pinnacled cathedrals. Frozen ramparts and battlements of fortified ice, or the sinuous, sensuous curves of sleek-surfaced transports of delight. With nine tenths of their mass underwater in shallow bays the bergs ground, littering the horizon like a compromised armada. They list, heel, roll, right themselves again, crack, split and fragment. Shattered faces scatter light. Compressed ice shines deep bottle blue from within. Textures range from gritty composites to scalloped delicacy. I am inspired by the timeless artist's imagination. Of course I feel cold. This is obvious but important. Unlike the Stygian sub-zero savagery of winter the summer is mild. Temperatures hover around freezing. However the chill contains a thinly veiled threat, knowing that a sharp-toothed wind can bite deep into your bones in minutes. Fear occasionally surfaces. This is forbidding and foreboding territory. Perhaps it is but a healthy respect for our interloper status? I feel alien. An imposter. Ill-equipped. This is not home. There is no warm embrace of earth. No green reassurance. Ice scours the land of almost all life. The only terrestrial growth to speak of is the incredible engine of icy locomotion that flows from the shores. In contrast the sea teems. The water is olive-tinged with the explosive growth of planktonic diatoms. Crab-eater seal fur and Orca skin glistens verdantly due to the attached algae. Krill graze this harvest, and they power a bounteous marine food chain of gargantuan productivity. I am astonished by the rich fecundity. Above all else I feel unbridled joy. Hope. Not all planets can be as beautiful as this one. Antarctica is like stepping into another world. I sense that same shift in consciousness that explorers or even astronauts feel. The overview effect of interconnection, interdependence and indivisibility writ large. My heart expands, fills with elation. I stand outside myself and know that in this moment there is only exquisite splendour. It feels amazing. This blog is part of a series. Read other instalments via the author's profile page.